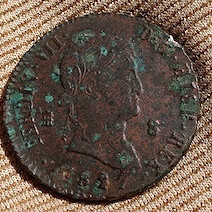 Photo from: Numismatic Bibliomani. . .
maravedí (mrs), OCast morabiti, moravedí (of the Moor), Ar. mitqál, (1/8 oz. gold or 1 gold dram), Eng maravedi. 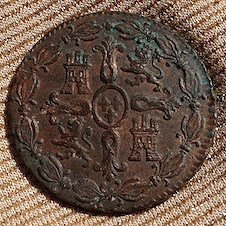 A Moroccan coin introduced by the Almovide Dynasty in Spain (1056-1147). Alonso VII promoted its use in Castile and Alfonso X established it in 1252 as a Castellan coin. It lasted until 1869, when Isabel II was in exile. It had various values at different times and in different countries and districts within the Iberian Peninsula. It was made of metals of various qualities including copper, silver and gold and had different weights.